Like others I wanted to try out Dark Pact for the new league and also with the Scion to try out the changes (although ended up picking Occultist as one of them which had no changes!). Most Dark Pact players seem to favour the Witch or Marauder so I thought I'd post up my Scion build in case anyone fancied trying it out. First time making a build guide so apologies if I've missed anything (I'll add it later if I have). I'd consider the guide more-or-less finished although I'm still wanting to try some of the other Ascendancy lines to see how good they are with the build too. How does Dark Pact work? Dark Pact is a Chaos damage spell that will sacrifice health, from either ourselves or one our Skeleton minions, to deal area damage to targets in a reasonably sized radius (it's a bigger radius if we self-cast it instead of using a minion). We don't use Skeleton minions so the backlash damage that Dark Pact causes goes straight to us. It's 6% of our life and it cannot be mitigated or reduced. This life that we lose is added to the Chaos damage caused innately by the skill to deal more damage. The more life we have the larger the damage we send back to monsters, therefore more life is more damage. To get around this dramatic 6% health loss we need to leech it back. Since we use Spell Echo this is 12% lost per cast as the secondary cast from Spell Echo isn't free. For this build we use Warlord's Mark which has a 2% health and mana leech and it leeches on both the original and echoed cast. By default leech is over-time and isn't instantly healed back (just how a health flask works), but we use the Vaal Pact keystone to instantly leech the health back at the cost of losing health generation. We wouldn't natively regenerate much health anyway so the loss is insignificant compared to the gain. Right now poeplanner.com is bugged and doesn't give you 2 passive points when you reach the end of an Ascendancy tree. Due to that and to avoid any confusion I'm using the pathofexile.com tree web instead. The Path of Building file contains a full set of gear, flasks, jewels and back-up gear for testing. The included gear is not mirror quality, and the rolls are between T2 and T5 affixes to give a more "real" example. In full unrealistic mirror quality gear your DPS would be more than double and your hybrid life/ES pool grows an extra 3000. As I've shown in the picture I've included all of the levelling tree's as well, so you can change as you level up and don't have to keep opening your browser to find out where to go next. 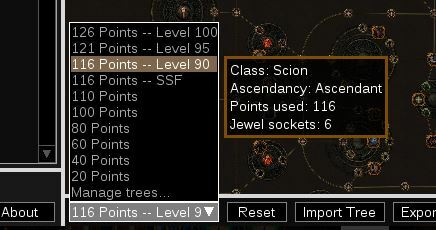 There's also an SSF tree in there for level 90 if you're interested in SSF. SSF: If you're not using Doedre's Damning then you need to shave off 6 points to get Whispers of Doom. You can take the points from anywhere you like, in the SSF tree above I took a couple of Life/Evasion nodes near Vaal Pact and a power charge in the Witch area. I consider the build done at level 90 but I've included two extra trees for level 95 and level 100 respectively as to what to pick up if you go beyond level 90. Major Pantheon: Solaris is an excellent choice for defenses. If you don't have Kaom's Roots then make sure you are using Brine King! Minor Pantheon: Garukhan and Abberath are great for quality-of-life. Ascendancy: Occultist first, then Assassin, then finish the Witch tree. Bandits: Alira is the best to help. Two passive points is also viable. Two 3-link's for your weapon slots. Enfeeble gives a large survivability boost. Assassin's Mark gives a large damage boost. I'd recommend Assassin's Mark until you get the Assassin Ascendancy and your crit is 50%+ without Power Charges. Beyond that I'd switch to Enfeeble for the extra damage mitigation. Conc. Effect gives a massive damage boost with a large area radius reduction. Controlled Destruction is a great damage boost, but you will lose 5%-9% crit. Inc. Area of Effect gives a minor damage boost with a large radius increase. Due to scaling at various points of when you'll be gearing/levelling up, you'll find that some gems are better than others. Controlled Destruction always gives a really nice DPS boost to your tooltip but losing that much crit chance is nasty for leech purposes and hurts your survivability. Two 4-links for your helm and gloves. CWDT for your helm, and Wither for your gloves. • Arcane Surge should be kept between 5 and 12 at max depending on how much Flame Dash costs (based on Voidbringer's roll and if you're using Apep's Rage). • I would avoid using Controlled Destruction early on when you start using Dark Pact as you will be low on crit. • Use Flame Dash to gain the Arcane Surge buff as much as possible (dashing between packs is perfect to keep it up). • Wither Totem is fantastic for bosses/tough monsters, although the totem has next to no life. Try to keep it active however, that debuff is amazing. There are a few unique's which are great for the build; one of which I'd say is borderline requried which is Doedre's Damning. The alternative is picking up the Whispers of Doom keystone (which costs is 6 points) or having a +1 Curse amulet. Try to get all of the recommended uniques although the luxury option(s) are totally up to you as while they add to the build they definitely not required. The recommended uniques add a lot to the build and, while not required per-say, will drastically improve your performance. Apep's Rage is the most expensive from the "Recommended" items and, currently, you can pick one up from 4 chaos (this will drop in time as the league goes on). Voidbringer and Kaom's Roots are 1 chaos each at most. It costs 0 - 1 chaos to get started (depending if you've went for Whispers of Doom) and 11 chaos for everything other than the luxury and optional items (at the time of writing). SSF: For SSF players there are a couple of changes we need to make to the build initially. For instance given how difficult Voidbringer's are to get in SSF we can swap them out for Maligaro's Virtuosity which, while not as good, are perfectly viable to use. We also can pick up Whispers of Doom instead of using Doedre's Damning temporarily until we get that ring. For more information on farming locations and gear options for SSF see the spoiler below. This is an excellent body armour and is very viable for us to use however it comes at a price and will not be for everyone which is why I can't recommend it as the default choice. It is a perfectly solid choice to use though and I recommend looking into it if you find its bonuses interesting. + It can achieve more damage overall because it has an innate Level 15 Added Chaos Damage meaning you can get a "7-link" by using 6 gems in it coupled with the bonus skill. + It is much easier to get a hold of than a well rolled Vaal Reglia and cost next to nothing to buy. ~ It also has Blood Magic which lets us spend life instead of manage on our skills. This is both good and bad. The good is that we don't need to use our mana, meaning we can utilise the remaining mana for other purposes such as running Arctic Armour for more mitigation. The bad side is that not only will Dark Pact be eating our health, but we'll be using it to actually cast the ability. - You will lose overall life as the "10% increased maximum Life" is worse than a T1-T2 life roll on a rare body armour. - You will potentially have much lower Energy Shield compared to using a Vaal Regalia. This wand can be a damage upgrade or downgrade over a rare wand or Apep's Rage depending on the rest of your gear. I would not blindly buy one without importing your character to Path of Building to find out if it's worth it. The better the rest of your gear is the better a Void Battery will be for you, but below "excellent" gear it can be a downgrade. Check first before you splash out on one! Helm: "Increased Dark Pact Damage"
Boots: "Cast Speed when Killed Recently" or "Damage Leeched as Life/Mana when Killed Recently"
For rare items to fill up the other slots we need a few different types of stats. Ideally they should be item level 84 for the maximum possible rolls on stats where possible. Wands like these are fantastic are a not much worse than unique wands like Apep's Rage. In fact, having one rare wand paired with one Apep's Rage is the best way to go. If you get Damage to Spells then I would highly recommend getting Lightning damage for the Shock chance. We need to use an Energy Shield base because we're using a 6-link with 5 blue/1 green gems. We could technically use a pure Armour base but it would be almost impossible to get 6 off-colours on it. The bases listed are the best bases to use. For the helmet slot we should be picking up an Armour base or Armour/ES base. This is our "Cast When Damage Taken" links which needs 3 red gems. You can get these colours on your gloves slot but it's quite difficult and isn't necessary when we can just an Armour or Armour/ES helmet. Ideally we want a well rolled Leather Belt for the bonus Life, although Heavy Belt and Crystal Belt are both viable. You can get a sizeable amount of life and resists on the belt slot (up to 166.5 Life). The Movement Speed stat comes from Tora's Bowmaker's Tools, but isn't required, it's just a quality-of-life boost. Very heavily defensive rings. You can go for Diamond Rings or/and a crit chance mod from Elreon if you want more crit. A very heavy damage-orientated slot. Aim for the most damage possible on this slot, and if possible, a +1 Curse corruption. You can also use a Diamond Flask if you want more crit in bursts. If you do not want to farm Doedre's Damning then you will need to get the Whispers of Doom at the cost Life or DPS. On the flip side you will regain a ring slot from having to use Doedre's Damning which has very poor stats. The difference though is not made up from one ring slot and not taking Whispers of Doom is always the better choice. The best option is an amulet with a +1 Curse corruption but is drastically harder to get as you'd need it on a good amulet. Outside of using Orb's of Chance to get the items you can farm or buy them, either through bosses like Atziri for her flask, using Divination Cards, Prophecies or from a level 8 Master (luck required!). The easiest is going to be Doedre's Madness (1 in 4). It will take a bit of farming to get the full 9 cards required, but it is do-able with some determination and elbow grease. The other two options, both of which will give a random unique ring, are not great (there are 46 rings in the game). This item is quite difficult to get unfortunately. The two card sets that reward this item are generic card sets and give you a random unique body armour. Given how many are in the game the chance of getting The Covenant is very low and I would not recommend farming them for it. This wand is quite difficult to get by farming cards. A good rare can be just as good/better than this wand. The reason I don't recommend this for non-SSF players is that it's extremely easy to get Apep's Rage on poe.trade and is very powerful for the cost vs. getting a comparative rare wand. For SSF players though this is a good option. You have a 1 in 17 chance of getting it through The Traitor card set. Unfortunately this item cannot be farmed and has no card sets or Prophecies that reward it. A very viable alternative to these gloves is Maligaro's Virtuosity. It can easily be farmed from The Betrayal card set or A Prodigious Hand Prophecy. These are extremely easy to farm using the card set. It's a drop from Atziri in The Apex of Sacrifice and is quite easy to obtain. You have a chance to get it from The Traitor card set, but is not worth farming for it. Using Orb's of Chance on a Prophecy Wand will be your best option. This wand can actually be a downgrade low-mid gear due to scaling. This will be difficult to obtain in SSF leagues but it is a luxury item and isn't needed. The only method to get this item is to combine the Agnerod staffs to create the Vinktar Square Courtyard map. It is a guaranteed drop from boss in there, the Avatar of Thunder, and has 4 variations. • "No leech" and "Hexproof" map affixes are borderline impossible. • High roll "Less effect of Curses" can be tricky in T11+ maps. • Be careful in T11+ with maps that have a few +damage mods; too many of them and you can be one-shot. • Some bosses on maps like Plateau and Volcano are curse immune therefore we cannot leech from them. We need to use our flasks to get around this, either using Atziri's Promise or bringing an extra health flask (see the video section for an example Volcano map). • Uber Lab is not required for the build, but those 3 passive points really help. • You can reach 10.5k hybrid Life/ES in mirror gear. Realistically though you're looking at 7.5k-8.5k, which is still excellent. • If you need Strength or Dexterity pick up Physique/Alacrity in between the Witch and Shadow area for a boost to either (respectively). • Cast speed hyper-inflates our eff. DPS to huge amounts but it's not realistic damage and can be dangerous to run. • You can use Inya's Epiphany boots over Kaom's Roots for more damage but less survivability. If you do you must use Brine King's pantheon. • If you're struggling with for a wand, then a Divinarius can be a decent stand-in weapon. I've made a full guide that I wrote as I levelled up myself with the build and amended on the way to give a real-world example of what I did to help newer players. If you're a new player to the game or would like some extra tips when levelling up, then please see the "Full Guide for Beginners" as it covers the whole game from Act 1 to 10 including what gems to buy, what side-quests to do, and what direction to go in to pick up bits a long the way (like skill books and Ascendancy trials). If you're familiar with the game then I'd recommend just using the "Quick and Easy Guide". If you've found you've got to the end of the guide, tried out Dark Pact and just realised it wasn't for you, and want to continue using Essence Drain then that's totally fine and I'd recommend looking into djnat's Mistress of Agony build. They have a great guide and their skill tree design is not a million miles away from mine, so it's a feasible jump if you really were happy with ED/Contagion and wanted to stick to it. For the first few levels use anything you want. In the beginner's guide I went with Blight. Once you hit level 12 you can pick up Essence Drain and you'll be using that until at least Act 8 with Contagion. We get Dark Pact around level 28 but we can't use that skill anywhere near that level because we can't leech the backlash damage back from using it, so we'll constantly be having to use health flasks. Around level 60 you can comfortably switch to Dark Pact for trash only, but for unique bosses you will need to use Essence Drain. You can fully go Dark Pact around level 66 to 70, depending on the gear you have at that time and how many links you have. If you're twinking a new character, or you have a friend that can help, then items like Lifesprig, Tabula Rasa, and Wanderlust are great choices for an early game boost. You could also get a piece of jewellery from Elreon to help with mana costs. The number on the left is the level I was at that time. 01: Run straight to town and ignore the monsters on the way. Kill Hillock at the end at pick Blight as the quest reward. 01: Keep spare Wands or Sceptres along the way. You want two of either for your 2nd weapon set to level up some gems. 03: Go through The Coast and find the waypoint. From there head south from it into Tidal Island and complete the quest. 03: Once completed, use the waypoint back to The Coast and following the coastline into The Mud Flats. 04: Click the Rhoa Nest's for the quest items (there are three of them) and head into The Submerged Passage. 05: Get the waypoint and find The Flooded Depths in The Submerged Passage to complete "Breaking Some Eggs" for a skill book. 05: Buy Contagion, Arcane Surge and Orb of Storms from Nessa after doing "Breaking some Eggs" in the Flooded Depths. 05: If possible link Blight > Contagion > Arcane Surge for your main skills. If you can't link them yet do it as soon as you can. 05: Carry on through The Submerged Passage until you reach The Climb. Once here rescue the prophet, Navali, and go in the Prison. 09: Buy Spell Totem and Void Manipulation from Nessa after reaching The Prison. Change your links too: Blight > Contagion > Void Manip. 09: If you've not done it yet, make sure you get the Trial of Ascendancy in the Prison while you're there. 11: Pick Flame Dash as the quest reward from killing Brutus in the prison. It's a great movement skill to bypass obstacles. 11: Buy Summon Skeleton and Wither from Nessa. Use Skeletons on tough monsters/bosses with your main skills to tank for you. Pair Wither with Spell Totem for extra damage on tough monsters/bosses. 12: Head to The Ship Graveyard and complete the quest for Fairgraves for a skill book, then head to Merveil's Caverns. 13: Purchase Essence Drain after reaching Merveil's Caverns. Replace Blight with Essence Drain in your 3 link as your main skill. 14: Kill Merveil to finish up Act 1 and then head into the Southern Forest in Act 2 and make your way to the Encampment. 14: Head north-east from the Encampment into the Old Fields. Keep going north-east into the Crossroads (get the waypoint here). 14: Head north-east again from the Crossroads and kill Kraityn at The Broken Bridge to get his amulet. 15: Go back to the Crossroads, then head west into the Chamber of Sins and work your way through it. 15: While completing The Chamber of Sins, make sure you finish the Trial of Ascendancy on level 2. 16: After completing the The Chamber of Sins, portal back to town and get Arctic Armour as your quest reward and enable it. 16: From town head south-west through the Riverways until you reach the waypoint in the middle of the zone. 16: Once you find the waypoint, activate it then head north-west along the cobblestone path into The Wetlands. 17: Kill Oak in the Wetlands for his amulet and get the waypoint, then go back to The Riverways and continue south-west. 17: Head into The Western Forest and follow the road to the waypoint. Keep following the path and unblock the road for a skill book. 18: Find Alira and "Help Alira" for her boost, and get the Apex from her. Go to the opposite side of the zone and into The Weaver's Chambers. 18: Kill The Weaver, portal back to town and pick Faster Casting as your reward. Pair it with Flame Dash for quicker movement. 18: Speak to Yeena and also purchase Controlled Destruction. She sells a few gems we will need, but don't need just yet. 18: If you have not done it yet, head to The Crossroads, go east to The Crypt and complete the Trial of Ascendancy there. 20: Head back to the Wetlands and go through the Vaal Ruins. Finish off Act 2 and head in to The City of Sarn in Act 3. 23: Rescue Clarissa in The City of Sarn, and then head straight into the Slums, and then in to the Crematorium. 24: After getting Tolman's Bracelet, portal back to town and buy Vulnerability from Clarissa. Use it on tough mobs/bosses. 25: Hopefully you'll have a 4 link by now from a random trash drop. If so, pair Controlled Destruction with your 3 link. 25: You should now be using: Essence Drain > Contagion > Void Manipulation > Controlled Destruction. 25: Go back to The Slums and into the Sewers. Get the three busts for Hargan here for a skill book and continue onwards. 26: Once you reach the Marketplace head to The Battlefront, or if you haven't done the Trial of Ascendancy, go to The Catacombs first. 26: Get the waypoint in The Battlefront and also the Ribbon Spool from the nearby Blackguard Chest, then go north-west to The Docks. 27: Find the Supply Container and get the Thaumetic Sulphite. Portal back to town, go to The Battlefront and to the Solars Temple. 28: Find Lady Dialla and give both the Thaumetic Sulphite and the Ribbon Spool. Get the Talc and use the waypoint back to The Sewers. 28: Use the Talc on the the Undying Blockade to allow you access to The Ebony Barracks. 28: From here head north-west to the waypoint. Get it and continue north-west to find, and kill, General Gravicius. 29: Keep heading north-west into the Lunaris Temple. Once inside find the waypoint and portal back to town. 29: Go and buy Dark Pact from Clarissa and slot it in to your gear so it can start leveling up. 29: While in town, open the Labyrinth portal and go through. Get the waypoint in the Aspirant's Plaza and then leave. 30: Head back to the Lunaris Temple and into level 2. Kill Piety and grab the Tower Key. Speak to Grigor in town for a skill book. 30: Use the waypoint to return to The Ebony Barracks and head east into The Imperial Gardens and follow the path to the waypoint. 30: From the waypoint, head north-west and follow the path to the Library. Do the quest for Siosa and take Efficacy as the reward. 31: Buy Warlord's Mark, Blasphemy, Assassin's Mark and Faster Casting. Pair Vulnerabilty and Blasphemy together for now and use it. 31: Set your links to: "Essence Drain > Controlled Destruction > Efficacy > Void Manipulation" and another for "Contagion > Faster Casting"
31: Head back to The Imperial Gardens and go south-east along the path until you reach the Sceptre of God; use the key on the door. 33: Go all the way up the tower until you reach Dominus, kill him, speak to Lady Dialla, and then zone in to the Act 4 Aqueduct. 33: Get the waypoint in The Aqueduct (although this should be automatic) and work you way through the zone until you reach the town. 34: Sell your junk at Kira if you need to, then head straight into The Dried Lake (south of town). Find and kill Voll, and get the banner he drops. 35: Once you reach level 2 of The Mines, find Deshret who's soul is imprisoned. Release her and you'll get a skill book from Tasumi in town. 36: Carry on through The Crystal Veins until you find Lady Dialla. Get the waypoint next to her and go back to town to sell and get your book. 36: You need to do Daresso's and Kaom's portals and get an item from each boss. Once you have both items, go back to Dialla in The Crystal Veins. 38: Enter The Belly of the Beast and work you way through the linear zone until you reach Piety on level 2. Kill her and carry on to The Harvest. 39: Once in The Harvest follow the corridor until you reach Piety, which is also standing next to waypoint for you to activate. 39: Head back to town and speak to Dialla for your quest reward and chose Spell Echo. Slot it somewhere for now to get it levelling. 39: Speak to Oyun while your here for your Golem reward. Chose Summon Lighting Golem and slot it in your gear to use immediately. 39: Go to Petarus and Vanja and purchase Increased Area of Effect and pair it with your Contagion > Faster Casting links. 40: Kill Maligaro, Doedre and Shavronne in The Harvest to get the pieces needed to open The Black Core entrance next to Piety. 40: Kill Malachai in The Black Core and portal back to town, then head north into The Ascent and Act 5. 40: Once you're in The Ascent head north-east along the chasm until you find the bridge, then north to the Resonator and enter The Slave Pens. 41: Work your way through the Slave Pens and kill Overseer Krow, then enter The Overseer's Tower camp and speak to Lani for your reward. 41: Go to The Control Docks and up the left side to find the Miasmeter. Head east to find Justicar Casticus and kill him then out to Oriath Square. 42: Get the waypoint and then head back to town. Sell up any loot and speak to Vilenta for your free skill book. 42: Keep aiming to go north-east until you reach the The Templar Courts entrance and use the Eyes of Zeal to open the door, then head inside. 42: Work your way through The Templar Courts to The Chamber of Innocence and grab the waypoint, and continue on to the Sanctum of Innocence. 43: Kill Innocence, talk to Sin, then head out of the The Chambers of Innocence and talk to Bannon. Go through the exit to The Torched Courts. 44: Head through The Torched Courts and go back through The Ruined Square and head north-west to reach the waypoint and Ossuary entrance. 44: The Ossuary is a large zone, but has a linear circular path so just keep heading in an anti-clockwise direction. Grab the Sign of Purity and leave. 45: Head south-west across the main square in The Ruined Square, then go south-east to find the Reliquary. Zone into The Reliquary. 45: Grab the waypoint, and start searching the zone in an anti-clockwise fashion for Kitava's Torments which rewards a skill book in town. 45: Once you have them, portal back to town for your skill book. Take the waypoint back to The Reliquary and zone into The Ruined Square. 45: Head north-west in the The Ruined Square across the square and you'll find the Cathedral Rooftop access (look for the marble stairs). 46: Work your way across The Cathedral Rooftop into the Cathedral Apex and attempt to destry Kitava. 46: Speak to Lilly Roth and sail to Act 6. 46: When you enter Lioneye's Watch head straight into The Coast. Find the waypoint then go in to The Mud Flats. Find Nessa in the eastern part. 46: Nearby Nessa is The Dishonored Queen who drops the Eye of Conquest. Grab it and head north-west and into The Karui Fortress through the gate. 46: Go north to find Tukohama's Keep. Go in and kill him for a skill book reward in town. Once dead, speak to Sin, zone out the other side, and go north. 46: You'll finally reach The Ridge. Zone in there and get the waypoint. Portal back to town for your book, then come back and continue on. 47: Eventually you'll reach The Lower Prison. Zone in and complete the Trial of Ascendancy in here. Once done, exit out in to Shavronne's Tower. 48: There are multiple floors to this area, just keep working your way up and kill Shavronne. If you've done the Tower map before, it's layout is identical. 48: Once she's dead, say hi to Sin, then zone out through The Warden's Quarter and into Prisoner's Gate. Grab the waypoint, port to town and sell up. 48: Head to the Prisoner's Gate and don't go down the road. Instead, go where you would have went in Act 1 for the Ship's Graveyard. 48: Find the entrance to the Valley of the Blood Drinker and go in. Fight and kill Abberath. Once dead, speak to Sin then head back to Prisoner's Gate. 49: Follow the road this time which will lead you into The Western Forest. Follow the road up and get the waypoint, and continue to The Riverways. 49: Head up the road and grab the waypoint. Portal to town and sell up, and speak to Bestel for your skill book, then go back to The Riverways. 49: From the waypoint follow the cobblestone road into The Wetlands. Find The Spawning Ground, and kill the Puppet Mistress for a skill book. 49: Portal out, speak to Tarkleigh for your skill book reward, then take the waypoint back to The Riverways and continue on north-eastwards. 49: When you reach the end of the path and can't go further turn south-east and follow the cliff to the entrance to The Southern Forest. 50: Grab the way point then head into The Cavern of Anger. Get the Black Flag and head into the Passage and follow it through to The Beacon. 51: Head north-east until you reach the building. Stand inside the gold ring to move the pillars. Do both of them and ignite the switch, then burn the flag. 51: Speak to Weylam Roth to head to The Brine King's Reef. Once there, find and kill him. This will unlock your first major God pantheon. 51: Speak to Sin to enable your Brine King Pantheon. After you've turned that on, speak to Weylam Roth to move on to Act 7. 51: Head into The Broken Bridge. Follow the path down to The Crossroads. Head south-east along the road to the Fellshire Ruins and on to the Crypt. 52: Grab the waypoint here and find Maligaro's Map, as well as completing the Trial of Ascendancy. Portal back to town afterwards to sell. 52: Use Maligaro's Map in the Map Device at the waypoint and go inside. Find and kill Maligaro, take the Black Venom, talk to Sin and then leave. 53: Speak to Silk and give him the Black Venom in return for the Obsidian Key. Head down to the level 2 of The Chamber of Sins. 53: On level 2 complete the Trial of Ascendancy here and then head towards The Den's entrance further up towards the top of the map. 53: Work your way through The Den towards The Ashen Fields. Grab the waypoint the head south and into The Forest Encampment. Kill Greust. 54: Take the waypoint back to town and speak to the necessary people. Get Greust's neckalce from Helena and go back to The Northern Forest. 54: Find and enter The Dread Thicket. Collect all the Firefly's, and enter The Den of Despair to kill Grukthul. Speak to Sin and enable her Pantheon. 54: Head back into The Northern Forest and follow the tree's up to the pedestal to put Greust's necklace in, then continue on to The Causeway. 55: Grab the waypoint on the way, then keep heading north-east. Get Kishara's Star out of the lockbox and go in to the Vaal City and head north-west. 55: Get the waypoint, speak to Yeena to give her the Firefly's, then head back to town to sell up. Speak to Weylam for your skill book. 56: Work your way down the area. There are 5 sections split over 2 levels. Find and kill Arakaali and travel to The Sarn Ramparts, Act 8. 56: Before we continue with Act 8, we should do both the level 30 and level 55 Labyrinth's to get our Ascendancy points. The first two points from the level 33 Labyrinth should be spent into the Witch area for the +40 Intelligence node and also the next skill point after it. The second Labyinth is the good one - this goes into the Witch Ascendancy, from there you want to choose "Occultist". The Occultist node will give you a significant damage and survivability increase. With the last point pick the first node leading in to the Shadow Ascendancy tree. 56: Head into The Toxic Conduits and work your way through there, into Doedre's Cesspool and through there towards The Cauldron. 57: Enter The Cauldron to fight and defeat Doedre. Go down the sewer, get the waypoint, and go north-east to The Quay. 57: Give Clarissa the Ankh of Eternity for a skill book. When done leave the arena and go back down the small stairs and on to The Grain Gate. 58: Grab the waypoint and work your way through the zone. Kill the Gemling Legionnaires for a skill book and move into The Imperial Fields. 58: Follow the road all the way up The Imperial Fields and into The Solaris Temple. Go through the zone, get the waypoint, and down to level 2. 58: Continue through The Solaris Temple until you reach the portal. Go through and get the Sun Orb, then portal out to town and sell up. 58: Go back to The Toxic Conduits and head south-west and into The Grand Promenade. Keep going until you reach The Bath House. 59: Enter the Bath House and get the waypoint. Go to the northern part of the zone and into The High Gardens. Get The Wings of Vasiti on the way. 59: Work your way through The High Gardens to reach The Pools of Terror. Go in and kill Yugul for a skill book and Pantheon, then port to town. 59: Go back to The Bath House, however instead of going north, go east into The Lunaris Concourse. Go a little ways in and get the waypoint. 59: Once you get the waypoint head directly north-west and into The Lunaris Temple. Work you way down to level 2 and claim the Moon Orb. 60: Portal out and head back to The Lunaris Concourse. Head south-east from the waypoint and into The Harbour Bridge. 60: Go through The Harbour Bridge until your reach The Sky Shrine. Go in and fight the sisters, and then head down the passage to Act 9. 60: Run through the Blood Aqueduct all the way back to Highgate. 60: When you're sorted head east out of the town into The Descent. Work your way down through The Descent and into The Vastiri Desert. 61: Search the desert for the waypoint and also the Storm-Battered Chest. Complete the event and get The Storm Blade for a skill book in town. 62: Head towards The Foothills from The Vastiri Desert. Find the waypoint and zone in to The Boiling Lake. Kill The Basilisk and get his acid. 62: Portal back to town to sell. Head back to The Vasitir Desert. Go north-west to find The Tunnel, zone in, get the waypoint and then exit to The Quarry. 63: Find Sin and the waypoint around the middle of the zone. Head south-west into the "arena" and kill Kira to get a skill book reward from town. 63: Portal back to town to turn that in, then take the waypoint back to the Quarry and head north-east in to The Refinery. 63: Kill General Adus in The Refinery to allow you gain access to the Theurgic Precipitate Machine and take the Trarthan Power back to Sin. 63: Head back to the Quarry and open the passage in to The Belly of the Beast. Work your way through to the Rotting Core. 64: Meet Sin at the core and talk to him. Enter all three portals one-by-one and defeat Maligaro, Shavronne and Doedre then enter The Black Heart. 64: Fight a combination of all three together in The Black Heart, and then speak to Lilly Roth to sail back to Oraith Docks and into Act 10. 64: Go up to The Cathedral Rooftop and into the Cathedral Apex to rescue Bannon then head back down to the Oraith Docks. 64: Back to the Rooftops and we're going south-east until we reach The Ravaged Square. Head south across the square to The Reliquary. 65: Grab the waypoint in here and start looking for the Teardrop. This is a circular layout map so just keep running around clockwise. 65: Once you've got it head out of The Reliquary and back to the square. Go north-east across the bridge and grab the waypoint next to The Ossuary. 65: Head around towards the east to find the entrance to The Torched Courts and work you way through there to The Desecrated Chambers. 65: Get the waypoint and start going around the map until you reach the Sanctum of Innocence. Fight the boss, get the Staff of Purity and port out. 66: Meet Innocence in front of Kitava's Horns just a little to the east from the waypoint in The Ravaged Square and go into The Canals. 66: Work your way through the zone to The Feeding Through. Travel through there and meet Sin and Innocence at the end. Fight and kill Kitava. 67: Once Kitava is dead you'll end up in Oraith. Speak to everyone and then go into The Templar Laboratory to meet Zana and do your first map. 67: At this point you're all done. You should be 67 or near enough by now. In all videos I'm using Warlord's Mark and Enfeeble as my curses, and my 6th gem is Controlled Destruction. In the Beacon and Volcano maps I was using Bisco's Collar for more drops as I was farming at the time. This is a fantastic amulet, but as it gives no stats other than increased rarity and quantity we lose a lot of damage. We are more than capable of using it however. I didn't use Inc. AoE or Conc. Effect in my links so you can get an idea of the bast area spread using just the skill which I find fine to farm with. The Courtyard map includes a breach so you can see how easy they are for us too. The Volcano map gives you an idea of how we deal with those bosses who are immune to curses (such as Volcano, Plateau and Orchard) without using Atziri's Promise. We have to use our health flasks and stagger our damage. It's easy to do and is quite safe provided you don't over extend yourself with Dark Pact and take too much of your life off. Thankfully only around 6 bosses are immune to curses. The safest option is of course using Atziri's Promise, however I wanted to show an example of what it's like without it and how to manage your health properly. Amazing guide, you are the best guide maker ever, please make guides for everything ! Hey, thanks a lot for the kind words. I've added a quick demonstration video, and a section for new players if they find they've reach the end of the guide and after trying Dark Pact actually prefer using Essence Drain (which we use to level up with). Does this build a farm end game bosses? This is such a nicely written guide I will have to try it. Been playing Hierophant Dark Pact Totems which is great but I think I might have to try this. Haven't played a Scion build for a long time, so that makes me nervous, but the way you have written this should help with that. not currently planning to play this build, but I have to say your guide is probably one of the most if not the most well written and planned out guide here on the forum. So much information great highlighting with colors and a great beginner's leveling guide for each act. Good job! Thanks folks, appreciate the comments on the guide! Honestly I've not tried yet as I'm still filling out my Atlas and just spend most of my time farming red maps for currency/drops. Uber Izaro is no problem, as are red maps (incl. T15 Beachhead). As you very rapidly leech your health back then unless something can one-shot you then you'd just stand there spamming Dark Pact and getting all your health back before you died (which is how it works for map bosses). There's a few occasions where getting hit very hard from a couple of different sources at the same time may kill you before you have a chance for your leech to apply, but it's rare. My last couple of deaths was from a massive bleed stack that I never noticed and taking to long to move out of Dominus' Touch of God in a twinned T14 Palace (with +104% extra lightning), so both my fault rather than a shortfall in the build. One recommendation I can apply is the use of Carcass Jacks (probably for better QoL) or The Covenant (cheaper and can be considered a 7L dark pact).